The River Tiber has its source high in the Appenine mountains to the north of Sansepolcro. The watershed of smaller rivers that flow into the wide Tiber valley where Tuscany and northern Umbria meet is known as the Upper Tiber Valley or, in Italian, the Alto Valle Tevere. In fact, the border with the region of Le Marche also follows some of the ridges that divide the Tiber’s catchment area from other rivers. Because the Upper Tiber Valley comprises two regions it is sometimes difficult to find information in one place. In the past, initiatives aimed at the visitor have not been co-ordinated – I have a small tourist office guide to the Upper Tiber Valley that only mentions places in Umbria. However, a recent scheme offering discounts for multiple museum visits in the Upper Tiber Valley indicates that things may be improving. Most of Gorgacce Rentals’ holiday houses are in the Upper Tiber Valley, in particular, the picturesque Niccone Valley, whose river joins the Tiber near the the town of Umbertide. 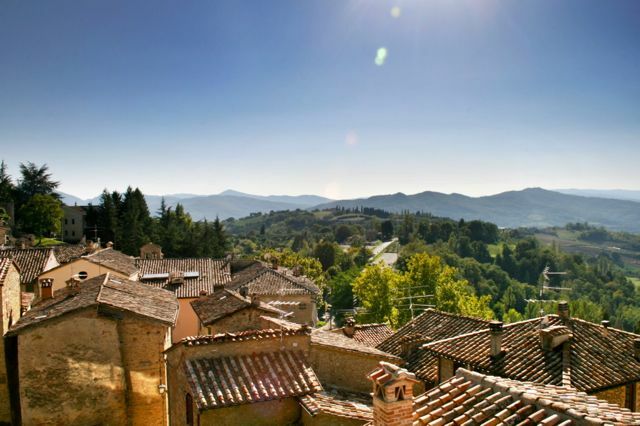 This blog post aims to address the piecemeal information about the area and provide visitors with a concise guide to the towns and villages, whether they are in Umbria or Tuscany. The E45 Super Strada runs down the main valley and connects the larger towns, as does a private Railway Between Perugia and Sansepolcro. If you start to explore the smaller places you will find yourself on slow, winding roads, often with breathtaking scenery, it would take several days to visit all the places mentioned below. The Upper Tiber Valley has a lot to offer the visitor: a climate of hot summers, mild springs and autumns (and fairly cold winters); rustic dishes cooked with the finest local ingredients; beautiful landscapes of wooded hillsides, olive groves and vineyards dotted with farmhouses and castles; art works by Piero della Francesca and Luca Signorelli amongst others; and, of course, the subject of this post, historic towns and hill top villages. 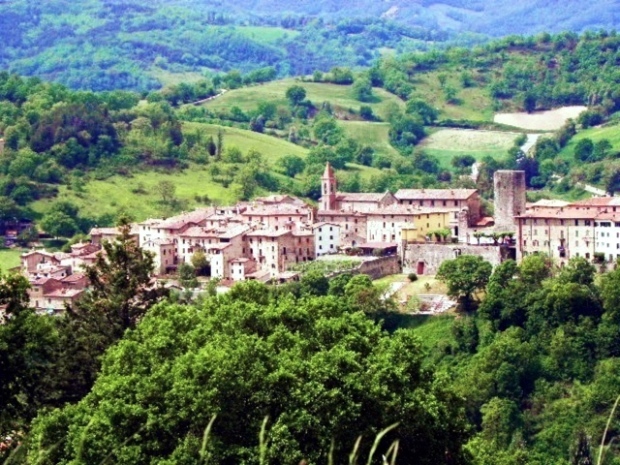 The larger towns in the Upper Tiber Valley are near the river and include Sansepolcro, Citta di Castello and Umbertide. 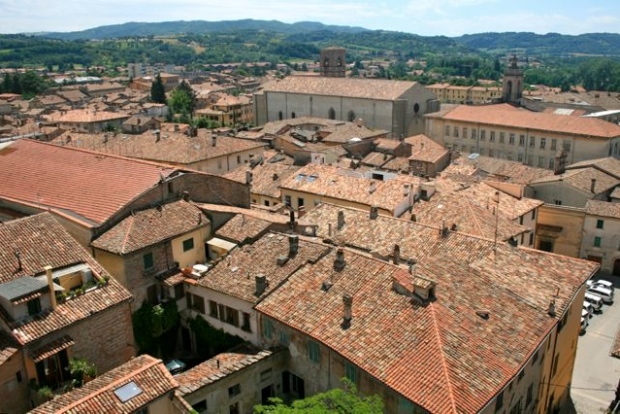 Smaller places worth visiting are usually hill top villages and include Caprese Michelangelo, Anghiari, Monterchi, Citerna, Lippiano, Monte Santa Maria Tiberina, Morra, Montone, Pietralunga and Preggio. Morra is in a valley but it is worth making the journey here to see Luca Signorelli’s Frescoes in San Crescentino. Sansepolcro is so named because crusaders / pilgrims supposedly brought back a stone from the church of the Holy Sepulchre. I don’t think this holy relic exists anymore – I’ve never seen it mentioned as something you can see. Once owned by the popes, in 1441 the town was sold to the Tuscan Dukes to raise money, as an interesting side note a nearby village of Cospaia was left off the maps when the transaction took place – the two sides’ surveyors used different streams as the boundary. The village became an independent republic and survived by becoming a centre for tobacco production and smuggling. The town’s most famous citizen was the Renaissance painter and mathematician Piero della Francesca, both Tuscany and Umbria claim him as “their” painter because of the transfer of the town from the Papal States to Tuscany. Two of his paintings are in the Museo Civico, the Resurrection and the Madonna della Misericordia, they are the highlight of a trip to Sansepolcro. Museo Civico – Piero della Francesca’s paintings. Centro Storico – wander around the pleasant old town, stop in a bar or restaurant. Duomo – Ascension by Perugino & 10th Century carved wooden crucifix. 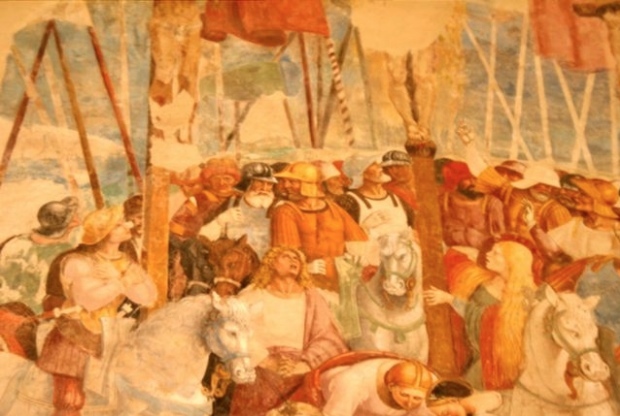 San Antonio – Processional banner with paintings by Luca Signorelli on either side. Citta di Castello has a lovely centro storico, and, being near the Tiber, it is pretty much flat which may be a welcome relief if you have spent a lot of time wandering around hill towns. There are plenty of bars and restaurants and a market on Thursdays and Saturdays, flea market on Sundays. The town has an unusual (for Italy) circular campanile that you can climb. It has two museums housing work by 20th century artist Alberto Burri, one time resident of Citta di Castello. These are well worth visiting and can provide a welcome change from the religious paintings of the Renaissance and Medieval periods. If you have time, the Pinacoteca houses the aforementioned Renaissance and Medieval art, much of it of dubious quality, however, it’s worth going in just to have a look around the frescoed palazzo that houses the collection. On second thoughts, perhaps I’ve being a bit down on the Pinacoteca’s collection – you will find paintings by Luca Signorelli, Domenico Ghirlandaio, a badly damaged Raphael, ceramics by the Della Robbia family and an ornate reliquary by Ghiberti (he of the Baptistery doors in Florence). Sometimes there are special exhibitions in the Pinacoteca, recently there was a privately owned Andy Warhol collection on display and a Mogdigliani exhibition is planned for spring 2014. Burri Museums – larger paintings outside of town, smaller works in the centro storico. Centro Storico – wander around and enjoy the ambience maybe visit a market. Campanile – climb the circular bell tower. Pinacoteca – lovely building, a few good paintings and a badly damaged Raphael. Terme di Fontecchio – thermal baths just outside town. Folk Museum (Tradizione Popolare) – discover local crafts & old fashioned farmhouse life. Printing museum – Citta di Castello still has a large printing industry. Umbertide is the nearest town to many of our rental villas in the Niccone Valley, like many Italian towns the outskirts are unattractive urban sprawl. However, the new part of town does have its uses, as many visitors discover when they use the Co-op supermarket. The old part of town next to the Tiber is the real attraction, especially on Wednesdays when there is a large and lively market in the old town selling fruit, vegetables, cheese, salami, fish and porchetta as well as a large clothing section. A tall castle tower known as the Rocca dominates the centro storico, there are often art exhibitions inside. In the last few years much of the centro storico has been pedestrianised and a large communal space below the Rocca is used for events in the summer, there is also a new footpath down to the Tiber from here. Umbertide Market – great value fresh produce. Quick stroll through the centro storico. The Rocca – exhibitions change regularly. 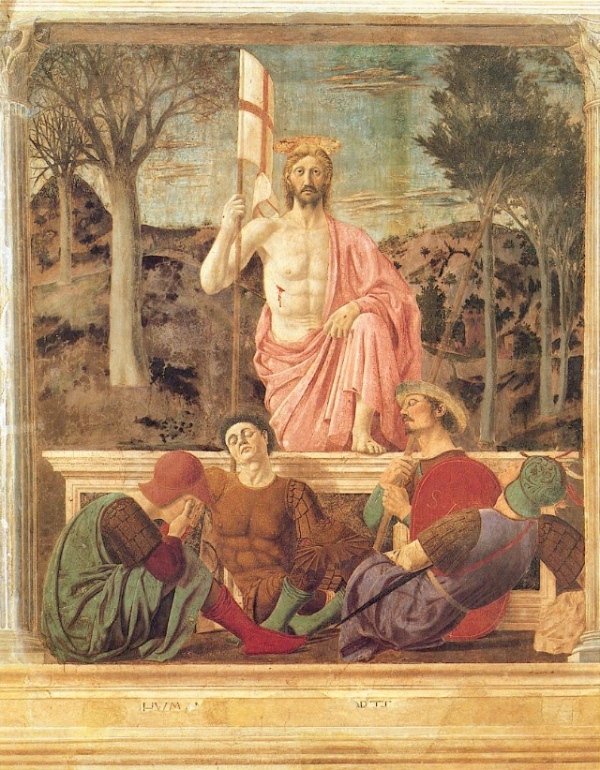 Santa Croce – Deposition by Luca Signorelli. Abbey of Monte Corona – octagonal campanile & interesting crypt. A village at the extreme northern end of the Upper Tiber Valley. It is famous for being the birthplace of Michelangelo but you won’t find any of his art there. La Verna, the monastery where St Francis is said to have received the stigmata is in the hills to the north of the village. There are several good restaurants and an (by all accounts) underwhelming Michelangelo Museum that is located in the house said to be his birthplace. The small town of Anghiari was site of a battle between the Milanese and Florentine armies in 1440, the fighting was depicted in Leonardo da Vinci’s lost fresco, The Battle Of Anghiari. There is some evidence that Giorgio Vasari (mannerist painter, architect and early art historian from Arezzo) painted over the fresco in Florence’s town hall, in what would if true, now be considered a massive act of vandalism. However, the frescoes were incomplete and damaged thanks to Leonardo da Vinci’s use of experimental pigments and Vasari would have been painting under orders from the Medici family. Machiavelli wrote about the battle and tells us that only one soldier died – he fell from his horse. The mercenary captains of the day often came to agreements before a battle, why lose valuable men when you can still get paid for putting on a show? 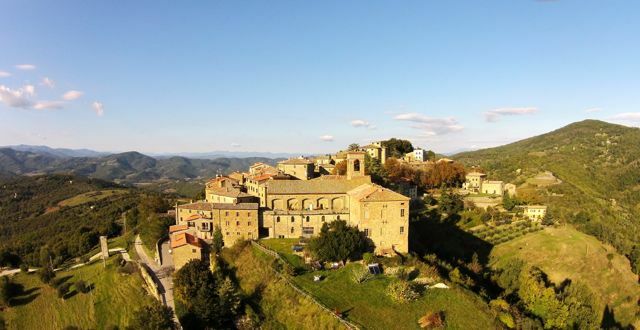 Anghiari has been given the status of one of the most beautiful villages in Italy, the main attraction of a visit is to wander the narrow medieval streets and enjoy the views across the Tiber Valley towards Sansepolcro and the hills behind. The thing to see is the town itself. Whilst a pleasant enough village located on a low hill, most visitors would probably pass Monterchi without a second thought were it not the home of Piero della Francesca’s Madonna del Parto (Madonna in Labour). 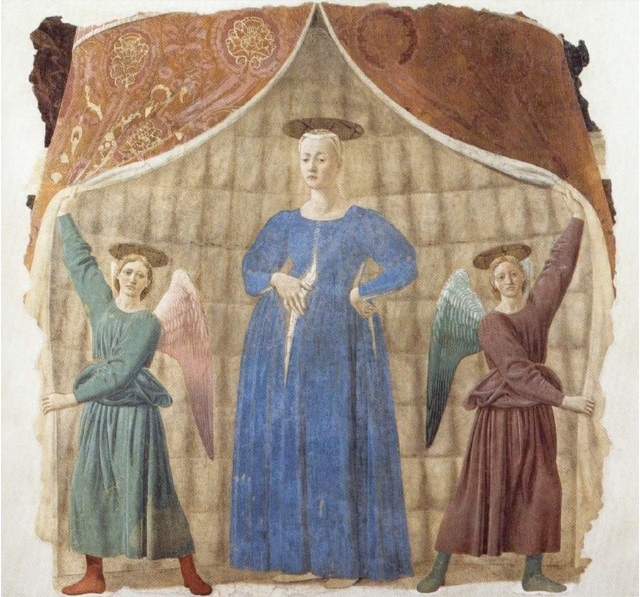 Piero della Francesca’s mother came from Monterchi and the village was supposedly the centre of a pagan fertility cult – probably both factors that helped him choose this unusual subject matter. The painting is very simple, two angels pull back the entrance curtains of a circular tent to reveal the heavily pregnant Madonna. A visit to Monterchi is often combined with a visits to Piero della Francesca’s frescoes in Arezzo, Sansepolcro, Urbino and Perugia on the Piero della Francesca Trail. After visiting the Pregnant Madonna, it’s worth taking a quick stroll up into the village and perhaps enjoy a coffee or glass of wine at the enoteca in the piazza. A visit to the cave-like wine & cheese shop in the central piazza. Close to Monterchi and higher up (450m), Citerna it would probably have more visitors than Monterchi if were it not for that village’s Pregnant Madonna. There are great views across the Upper Tiber Valley, a covered walkway inside the village walls and, in the church of San Francesco, a terracotta Madonna and Child once kept behind the altar, but now recently attributed to Renaissance artist Donatello and displayed in a side chapel. San Francesco – Donatello’s Mother and Child. A walk around the village taking in views & the medieval covered walkway. A small hill top village with attached (private) castle. Because of its size, there is not a lot to here, if you are passing you could stop for a quick stroll and a drink in bar. A few kilometers from Lippiano, you’ll find the start of the Marzano Walk, a route from my e-book Circular Walks On The Tuscany Umbria Border that takes in old ridge trails and the abandoned village of Marzano. Monte Santa Maria Tiberina managed to stay independent until Napoleon invaded Italy in the early 1800’s. 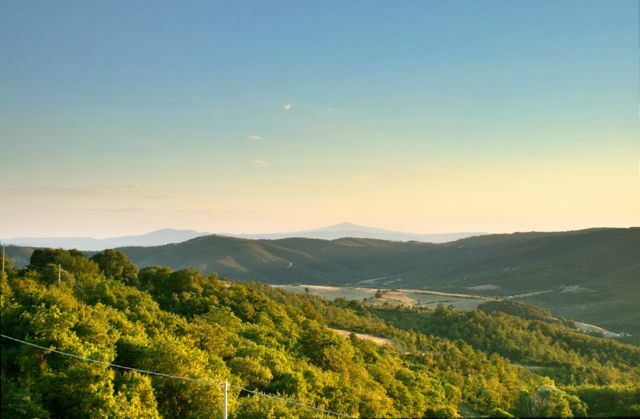 Situated on a high point on a ridge, its distinctive shape is visible for miles around. Ruled by the Marquises of Bourbon del Monte – descendants of Frankish invaders, the village was one of the few places in Europe where a duel could be fought legally. A walk around the village and a panoramic drink on the terrace outside the trattoria / bar. Santa Maria church – built around 1000CE, impressive stone baptismal font. Morra is surrounded by lovely countryside and many of the farmhouses nearby are now holiday homes. The village itself is not particularly noteworthy (sorry Morra!) but the church of San Crescentino has a remarkable fresco cycle of the Easter story by Luca Signorelli. San Crescentino – Luca Signorelli’s frescoes. Badia Petroia – 11th Century Benedictine Abbey. Basilica of Canoscio – large church over-looking the Tiber Valley. A perfect hill town that, along with Citerna and Anghiari, has been designated as one of Italy’s most beautiful small towns. 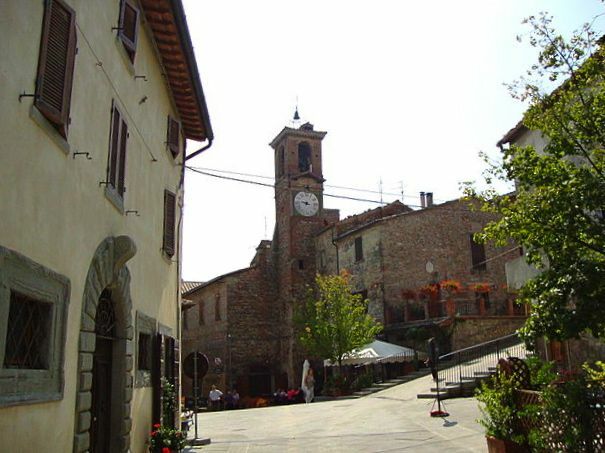 Montone was the hometown of a famous mercenary captains, Andrea Fortebraccio, also known as Braccio Fortebraccio (Arm Strongarm). Before his death in a battle against the papal army in 1424, he was the ruler of a large part of central Italy. 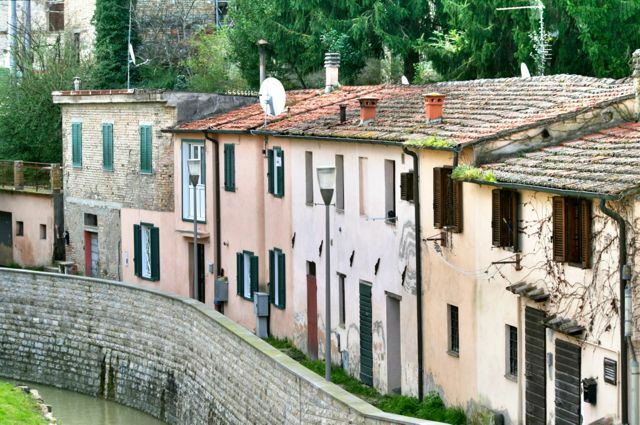 as you have probably come to expect by now, Montone has beautiful stone buildings and narrow alleyways and incredible views across the Carpina and Tiber Valleys. There are several restaurants and a couple of bars in the Piazza Fortebraccio where you can enjoy a drink. In one of the town’s churches (San Giorgio also known as the Collegiata) is what is said to be a thorn from Jesus’ crown of thorns – donated to the town by the son of Andrea Fortebraccio (he had been given it by the Venetians after fighting in their army). According to my tourist office guide this church also has a painting by Perugino – this is the first I’ve heard about it, so I’ll have to take a look inside one day and confirm if this true. The church of San Francesco and the attached monastery are now a museum, one of the 15th Century paintings (by little known Umbrian artist Bartolomeo Caporali) shows Montone in the background. From the church garden there are fantastic views of the surrounding countryside and the town’s rooftops. 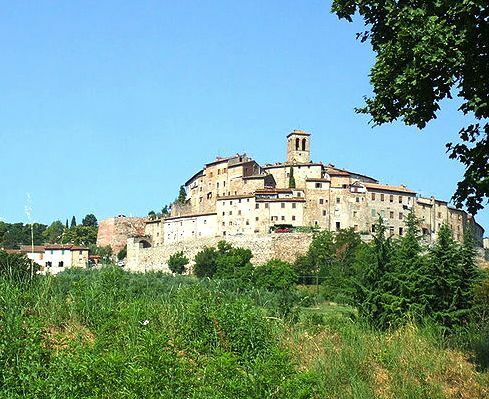 A few kilometers east from Montone is the Rocca d’Aries, a castle perched high on a ridge. You can walk past the Rocca d’Aries if you follow the Montone Walk, a route in my book. A walk around the town of Montone taking in the views. A drink in the piazza. San Giorgio (Collegiata) – reliquary containing the thorn & a Madonna by Perugino. Montone Walk passing the Rocca d’Aries. 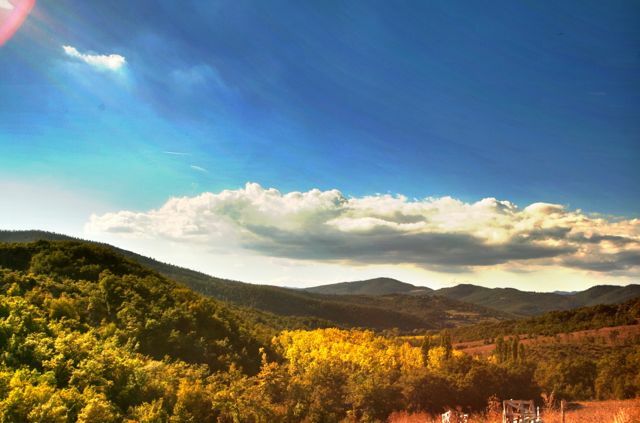 Located deep in the picturesque countryside of northern Umbria, Pietralunga feels like it’s a long way from anywhere. Close to the border with Le Marche, it is a pleasant small town built on the remains of a Lombard fortress. The Monte del Vento walk in my book, Circular Walks On The Tuscany Umbria Border starts a few kilometers from Pietralunga. I know people who rate the town’s pizzeria so highly that they will make the 25 minute drive along the road from Umbertide just to eat there. A hill top village high above the Niccone Valley, the location of many of our holiday villas. The views from up here are, of course, wonderful. The village doesn’t take long to look around but there are a couple of bars and a restaurant where you can stop for refreshments. 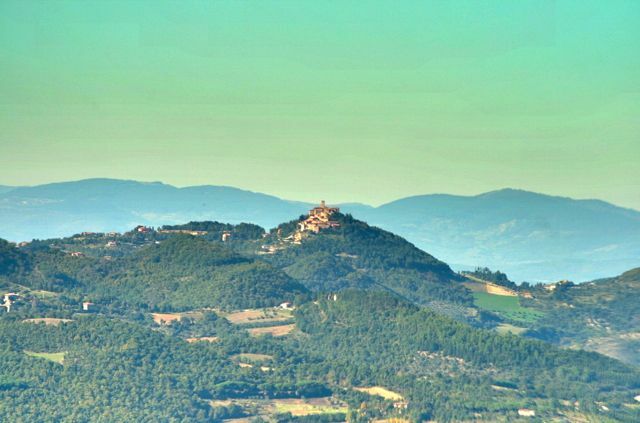 There are many Castles In The Niccone Valley and several other villages including Lisciano Niccone and Mercatale di Cortona at the western end of the valley. People from the Tuscan part of the Niccone Valley (Mercatale) refer to it as the Val di Pierle, named after the hamlet and abandoned castle of Pierle. Several of the hiking routes in my e-book, Circular Walks On The Tuscany Umbria Border are in the Niccone Valley including the Migianella Walk.